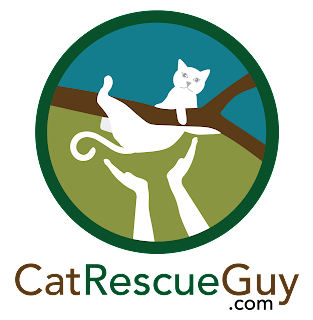 Sometimes I rescue a cat, and sometimes I just scare them down. Beebe was in the latter group. From what I learned about this sweet 7-year old girl beforehand, I thought there was a chance that she would be happy to see me in the tree. After all, she has been known to give strangers a friendly greeting in the past, so hopefully she would do so again. But before I even started climbing, I could tell from her cries that she was feeling a little scared. As I got higher in the tree, her fear only increased. Beebe (pronounced with two syllables) was about 30 feet high in a very large tree, and I was concerned about her climbing higher or very far out and out of reach on the very long branches. I set my climbing line almost 20 feet higher than she so that I would be better positioned if she decided to go farther away from me. I also set the climbing line on the opposite side of the tree from her so that I could climb up above her without being seen and be in a position to prevent her from going higher. If she wanted to get away from me, she would have to go down or out. 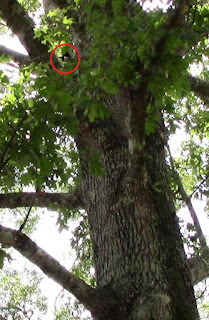 As I was climbing into position, Beebe would jump down to the next branch below her each time she felt scared. The branches were fairly large, and she safely handled each jump with the skill and finesse that only a cat can perform. As I descended directly above her, she jumped to the lowest branch on the tree and was still about 20 feet high. Without hesitation, she crawled head-first down the trunk for a few feet, and then she boldly leaped out to the ground. I watched as she spread her legs, formed her body in the shape of a parachute and used her tail to keep her body positioned horizontal. She landed perfectly on a flat spot on the ground and quickly ran to the back of her house. Beebe was soon inside and looking just fine. She had a chance to drink, eat and get some loving from her family who were very glad to have her back home. 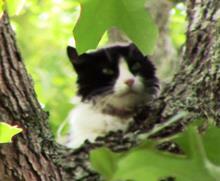 Beebe had been in the tree for only one night, but that was a long time for this close-knit family. After I got back home and Beebe settled in, I received this picture of her relaxing on a table. Beebe had a stressful experience, but she is doing just fine now.